For my 21st birthday, my Dad took to to Cancun, Mexico for a vacation. There was lots of pool time, snorkeling, and exploring the are. Granted, this was 2002 before there was a travel warning for Mexico because of all the drug cartel issues. 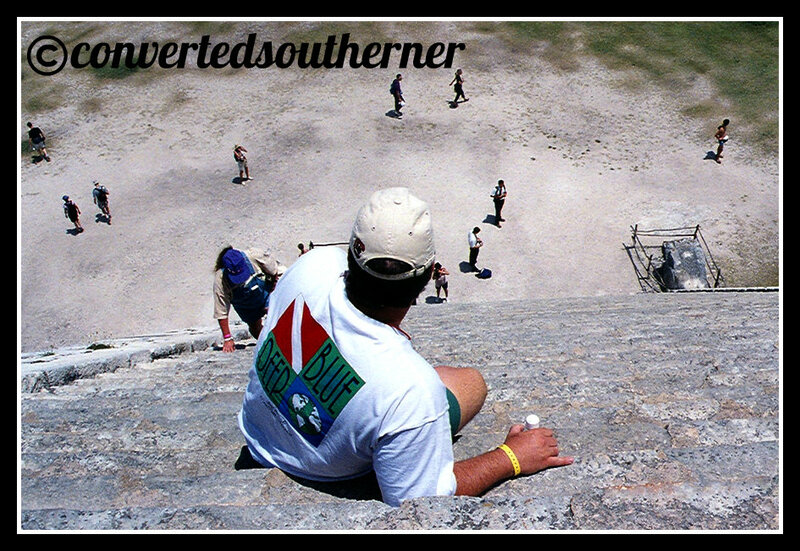 One day we took a day trip into the middle of the Yucatan Peninsula and toured the ruins of Chichen Itza. Chichen Itza are the ruins of a huge and powerful Mayan city from like 800 AD (at least according to Wikipedia). It was so cool exploring the whole place, but at some point my Dad and I decided we wanted to go up to the top of the center temple… the Temple of Kukulkan. The view was lovely, but it is like 70 something feet high. And it was designed with such precision, it is lovely. But all that loveliness that has stood for hundreds of years…. comes with really steep steps. I mean REALLY steep. It was at such an angle, we could walk down. We went down scouting down on our asses. The above picture is one of my Dad. We were just happy we didn’t tumble down! Look at that drop! Would you want to walk down that?